Students at the St. Helens School District's alternative high school, Columbia County Education Campus, started classes this week in a brand new building. 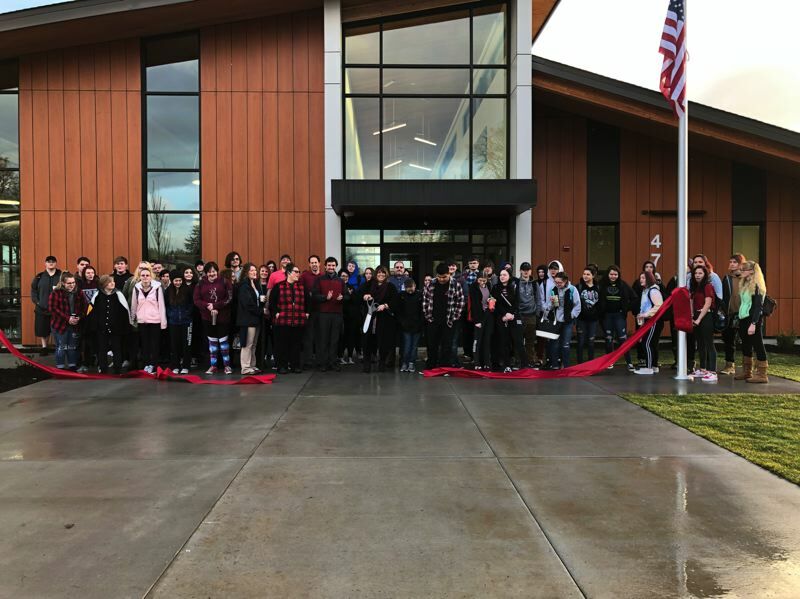 On Monday, Jan. 7, the district held a private ceremonial ribbon-cutting for students and staff at the school, where students were able to set foot in the building for the first time since construction was nearly completed earlier this month. Diana Kessler, a project manager with HEERY, the district's contracted consultant, explained that an outdoor covered play area on the north side of the building will be completed later this year after the district is able to relocate portable classrooms in that area. Those classrooms previously housed CCEC students and staff. Creation of the new building is part of a $49 million construction bond passed by voters in 2016. The district also received a capital improvement matching grant from the state for $4 million in conjunction with the bond's passage. After a year of working with consultants, designers and contractors to do the work on the new district buildings, a ground-breaking ceremony was held last March for the CCEC campus. While construction of the new building continues to be wrapped up, students were able to start the second half of the school year in the building this week. The bond funding was intended to pay for the $7.6 million CCEC building, as well as a brand new $34 million middle school building, which is under construction. The middle school is expected to be completed later this year. Remaining funding will be used at the district's high school for safety upgrades and to improve science classroom lab space. In October, the school board held discussions about what upgrades are possible with the roughly $5 million of available remaining bond funds, and wondered if seeking greater bond funding would allow for a more significant upgrade. Those discussions continued during a board work session this week on Wednesday, Jan. 9. During the same meeting, the board discussed renaming CCEC now that the new building is completed. Students at the high school were asked for input on name suggestions and the board reviewed some of those options Wednesday. While a new name was not selected, many of the board members favored including the words "St. Helens" in the name instead of "Columbia County." Board members agreed to consider other name options after reviewing student selections and will likely ask for public suggestions during an open house at the new CCEC building on Tuesday, Jan. 22, from 5 to 7 p.m. Due to limited parking availability at the CCEC facility, the school district is asking open house attendees to park at the St. Helens Middle School, where shuttle services will be offered.